SITTWE & MAUNGDAW, Rakhine State – Everyone flees, except for a few men left in the villages to take care of our livestock, said Ma Hla Aye Mon, an ethnic Daingnet woman in her 30s. She has been taking shelter at a monastery in Ponnagyun Township, some 33 kilometers northeast of Sittwe, the capital of Rakhine State. “We are afraid that if the kalar militants dared to attack these 30 security outposts, what would they do to us, to the ordinary civilians?” she told The Irrawaddy in early September, referring to the Aug. 25 attacks by the Arakan Rohingya Salvation Army (ARSA). “Kalar,” a derogatory term, is used by many in Myanmar to refer to those of South Asian descent. Ma Hla Aye Mon’s fear reflects that of ten of thousands internally displaced persons in Rakhine State. She is from the Daingnet village of Taung Maw in Buthidaung Township. Taung Maw is home to about 80 households and sits close to the Mayu mountain range. Villagers rely on farming, and catching crabs, frogs and fish, but since the Aug. 25 incident, they can no longer go out to work, Ma Hla Aye Mon explained. Myanmar’s Daingnet population is estimated to be less than 20,000, but more than 100,000 reside in India and Bangladesh, calling themselves “Chakma.” It is one of six sub-ethnicity of the Arakanese, which include Mro, Daingnet, Thet, Maramagyi, Kami and Kaman. After August’s militant attacks against Myanmar security forces in Maungdaw—and in the “clearance operations” which followed—women have arguably suffered more than their male counterparts, fleeing from their homes with newborns, young children and the elderly. Across the border in Bangladesh, more than 400,000 self-identifying Rohingya Muslims have fled Myanmar, according to United Nations estimates. The refugees consistently state that Burmese security troops destroyed their homes and forced them out of the country; their plight has been widely covered in international media. Meanwhile, the displaced within Myanmar speak of living in fear of militants active in the area. In Myanmar, the government only allows journalists access to coverage within “safe zones” or areas under the control of armed forces, in southern Maungdaw, where some 30,000 ethnic minorities, like the Daingnet, are internally displaced. The majority of Muslims who have fled are in the northern part of the state, close to the Bangladeshi border. This lack of access has meant that stories from groups like the Daingnet have remained largely unknown to the outside world. 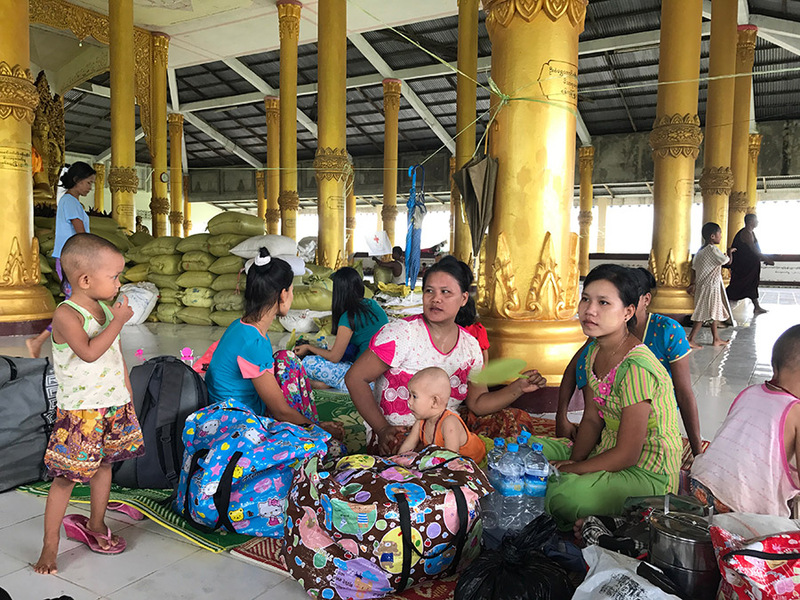 The women with whom The Irrawaddy spoke—including Daingnet, Arakanese, and Hindus—said they feel there is no security for them in their villages. Recent attacks by Muslim militants, they said, have led them to fear that their groups “could be wiped out.” Muslim women also expressed fear that they could be mistaken for militants by the army, or be accused by the militants of acting as government informers. Rakhine State’s official population of nearly 3.2 million has a majority of Buddhist Arakanese, and includes more than 1 million self-identifying Rohingya Muslims who are largely stateless and were not enumerated in the 2014 census. The government does not recognize the term “Rohingya,” and instead required them to register as “Bengali,” classifying them as immigrants from Bangladesh; many refused. Violence between Buddhists and Muslims broke out in 1994 and in 2012, displacing thousands. Trust and further coexistence between the state’s various religious communities now seems to have disappeared. U Chan Sein Hla, a 60-year-old Daingnet man from Thein Taung Pyin village said that since 2012, his community has lived in fear. The women and girls in his community have since left for Yangon’s industrial zone, where he says they believe they’ll be safer. He added that his village had never received support from the government or international NGOs. Ma Thet, an Arakanese Buddhist resident of the mixed Buddhist and Muslim Alethankyaw village, said that on Aug. 24, the day before the attacks, she sensed an uneasiness in the community. Later, homes from both religious groups were burned down. Residents of 176 Muslim villages have fled to Bangladesh, and remain in 261 villages. The government’s information committee has said that those who have fled are affiliated with the ARSA, which it has declared a terrorist organization. It also claims to have killed some 400 suspected militants in more than 90 clashes. Daw Shwe Nu, a 64-year-old Muslim woman from Myoma Ka Nyin Tan quarter in Maungdaw, told the reporters that she “does not want to leave” her village. Her quarter has thus far been spared arson or attack. “I feel very sad for this instability. Why is this happening?” she told the reporters during a government-organized reporting trip in early September. An escape to the border does not come cheap—those fleeing often have to pay for a ferry across the Naf River to Bangladesh. “We cannot go as we have to have money to pay for it. They ask 100-200,000 kyats (US$73-147),” Daw Shwe Nu said. A tourist from Germany, Reinhart Unverricht, spoke to this Irrawaddy reporter in Ponnagyun. He said that he was surprised by the difficult conditions within Rakhine State. Referring to media based in the West, Unverricht said that he had seen much coverage from the perspective of reporters stationed on the Bangladeshi side of the border. “They do not show the side from here. Here is also horrible,” he said, referring to the displaced Daingnet in temporary shelters.